Shaver’s Creek has embarked on the road to becoming a Zero Waste facility. We look to nature, where nothing is wasted, as our guide as we strive to eliminate material sent to the landfill. Zero Waste means that we reduce, reuse, recycle, or compost nearly all of the materials we utilize. Our ultimate goal is to send no garbage to the landfill. As a society, we produce tons of trash in the form of plastic containers, packaging, and a seemingly endless variety of disposable items. Much of this waste ends up in the landfill, where it not only costs money to dispose of, but also damages our environment. We believe that anything that can be reused, recycled, or composted should be. How Does Zero Waste Work at Shaver’s Creek? Our first and biggest step toward Zero Waste was removing our trash dumpster. This forced us to find new avenues for our waste and to think creatively in terms of reducing, reusing, and recycling. All materials must be rinsed and/or free of organic material. Shaver’s Creek is NOT a drop-off site for home recyclables. Thanks to Penn State’s large-scale composting facility, we are able to compost organic materials that a home composting system may not be able to process, including all sorts of complex organic material. If you cannot recycle or compost an item at our facility, we ask that you please dispose of it at home, as we have no dumpsters or trash cans on-site. If you have any questions, please call 814-863-2000 or ask a staff member when you’re here. Your participation is greatly appreciated! While Shaver’s Creek has worked hard to become a Zero Waste facility, we have achieved this by using recycling and composting options available to us through Penn State that, in some cases, might not be available to area residents. However, there are simple steps you can take at home to embark on your own road toward zero waste. The first step is to remember that the old adage of Reduce, Reuse, Recycle is listed in order of importance; before we even reach the Recycle step, we should be considering how to Reduce our waste and fix or Reuse objects that are still functional. It can be fun to get the whole family involved in reducing waste! Choose wisely where to shop. There are several farmers’ markets in the State College area where you can find local foods straight from the source, with no need for excessive packaging, extra energy spent on preservatives, and fuel for transportation over long distances. Visit buylocalpa.org for a directory. Buy in bulk. Not only is it generally cheaper, but the reduction in packaging can also be significant. Consider small changes, like instead of buying individual yogurt cups, try a larger container and split it up over the course of your week, or buy larger beverage containers instead of individual bottles. Reuse! Use a reusable lunch box with glass, steel, or plastic containers for food. Use reusable utensils and a thermos or reusable bottle for your beverages. Try mugs, washable plates, cloth napkins, and rechargeable batteries instead of their disposable counterparts. When they ask you “paper or plastic” at the grocery store, answer “cloth”! You can even visit Centre County Recycling & Refuse for a tour of their transfer station and recycling station similar to the tour seen in the Zero Waste Watch video. Contact Education Coordinator Amy Schirf for more information. Huntingdon County collects aluminum cans, steel/tin cans, bimetal cans, dry newspapers, dry telephone books, dry magazines and catalogs at . Here are some links for curbside recycling in the borough and drop-off locations. Although not accepted by either county, you can bring your Styrofoam packing peanuts to a UPS Store, where they will reuse them. A backyard compost system is a great way to reduce waste at home and provides a nutrient-rich resource for a garden. Effective composting might require a little research if you haven’t composted before. The Cornell Waste Management Institute published a four-page “Home Composting” brochure, which provides an overview of the basics of composting. You might also want to check out this twelve-page guide titled “The Green & Brown Alternative,” which provides more in-depth tips on separating organic materials and choosing a compost unit. State College Borough collects food waste for composting; learn more about the composting program. Penn State’s Sustainability Portal offers excellent directions for Penn State employees to create a “Green Team” in their own office. They also have lots of common-sense ideas for any workplace. Their Green Paws program offers a series of steps to take in the office. Although some items are Penn State–centered, many steps can be taken in any office and will save money, energy, and reduce waste. If you are a Penn State student in East Halls, check out the Eco-Rep program and become an ambassador of Zero Waste in your dorm! In our efforts to be a Zero Waste facility at Shaver’s Creek, we not only focus on diverting our day-to-day waste from the landfill, but strive to make our programs and festivals Zero Waste events as well. Next time you visit our Maple Harvest Festival, Native Plant Festival, Music Festival, or Fall Harvest Festival, be prepared to go Zero Waste! Look for staff or volunteers wearing “Zero Waste Czar” T-shirts donated by Penn State’s Office of Physical Plant Waste Management Team. These czars are here to help you sort your recycling and compost, and are available for any questions or comments you may have about Shaver’s Creek’s Zero Waste efforts. You will often find Zero Waste czars next to our “Zero Waste Zambonis” — recycling/compost stations on wheels designed to “sweep up the waste,” and positioned at key spots around the festival. We also work with food vendors to ensure that any utensils, plates, cups, and packaging they use are reusable, recyclable, or compostable. We also strive to partner with vendors that use locally and/or sustainably produced ingredients or materials. Our 2011 Fall Harvest Festival — the first after our transition to zero waste — was a huge success. 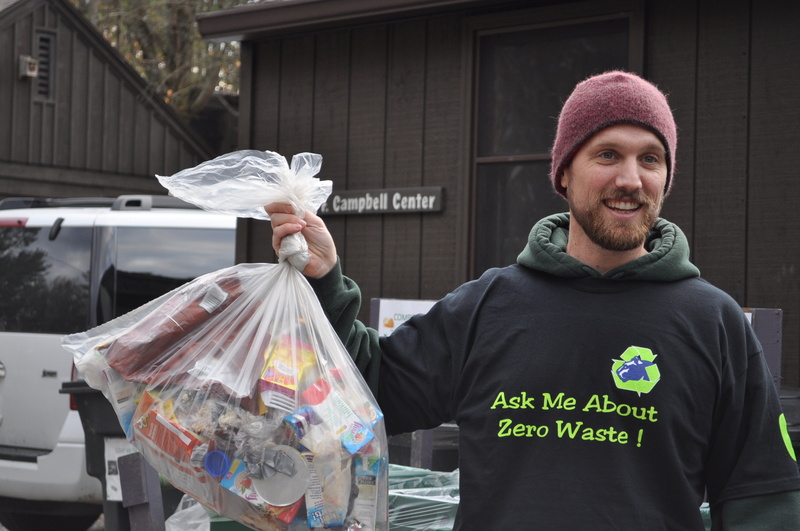 In this photo, Rob Andrejewski, an early leader of Shaver’s Creek Zero Waste efforts, holds the entirety of our trash generated from more than 500 festival visitors.